This is my favorite kind of corkscrew. Once you get the knack, it's fun to impress with finesse! These fit in the hand well and are very solid. 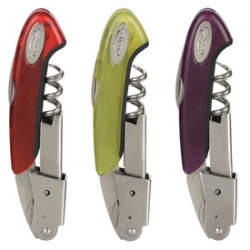 This is my favorite kind of corkscrew and these are good and solid and fit in the hand well. They take a little skill to learn to use, but once you do, it's fun to impress your guests with your bottle opening finesse!